In a piece I wrote for the Boston Globe two years ago, I researched the cost and benefits of installing rooftop solar panels on your home. In the process, I learned a ton about the solar energy industry, the various tax and legal incentives in place to encourage homeowners to go solar, and how to crunch all the numbers involved. (Also, I got a pretty good-sized headache for my troubles!) 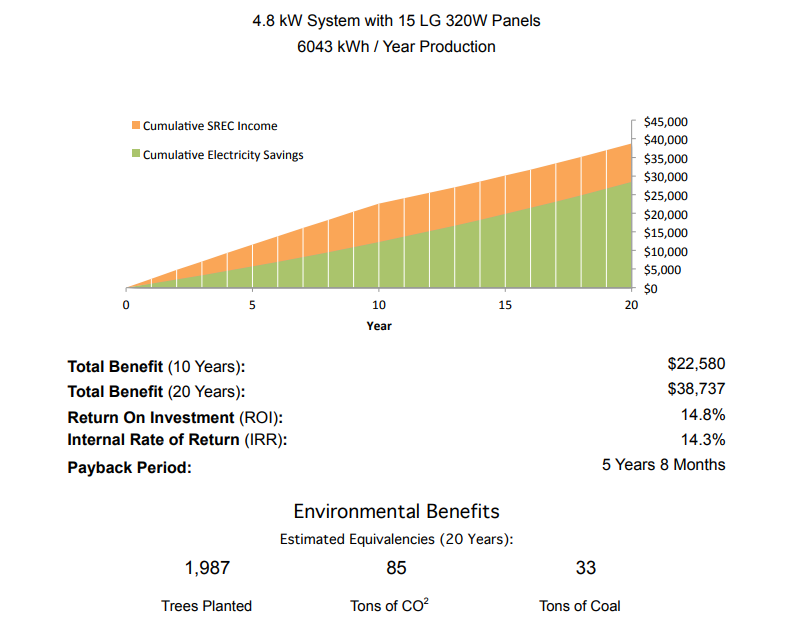 So, are solar panels worth it? Good grief, yes! At least, here in Massachusetts they sure are. And that yes comes with some other important caveats – chief among them, not everyone’s roof is right for solar. But ours was, and after researching that article with a pretty open mind, I was convinced that we needed to go solar – and pronto. Here’s why solar panels are usually worth the cost — if your roof gets a lot of sun and is in pretty good condition — and a look at our experience getting rooftop solar installed. The idea of producing electricity from the sun’s rays — which are just hanging out up there in the sky all day anyway, being hot and bright and full of energy whether you do anything with them or not – holds a pretty undeniable appeal to people of all walks of life. Whether you’re an off-the-grid doomsday prepper, a tree-worshipping environmentalist, or just someone who wants to use less fossil fuel and maybe do a little something to help out our beautiful Mother Earth, rooftop solar is an attractively simple option. But, it can cost quite a bit of money upfront. Now, we’re the type of people who are willing to pay extra to help the environment – it’s a major concern for my wife and me. Through National Grid’s ‘Green Up’ program, we used to pay bit extra on our bill each month to ensure that 100% of our electricity came from renewable sources. But not everyone’s like that, or able to afford it, and that’s totally understandable. Here’s the good news: In Massachusetts, at least, an investment is solar panels is well worth it, and usually pays itself off in just four or five years. After that, you’ve got free electricity for another decade or two. That makes sense whether you care about the environment or not. Energy here is expensive. Well duh. Everything here is wicked expensive, from houses to baseball tickets. But because our baseline electricity costs are among the highest in the country, it makes free solar power all the more attractive compared to places where electricity is cheap. You’ll break even on your investment much, much faster. There are considerable tax rebates. The biggest tax incentive for installing solar is the 30% kickback you’ll get from the federal government, which was extended through 2019. (In 2020, it drops to 26%, and then it drops again to 22% in 2021. After that, it’s gone – at least for now.) But Massachusetts kicks in an additional 15% (up to $1,000) at the state level. 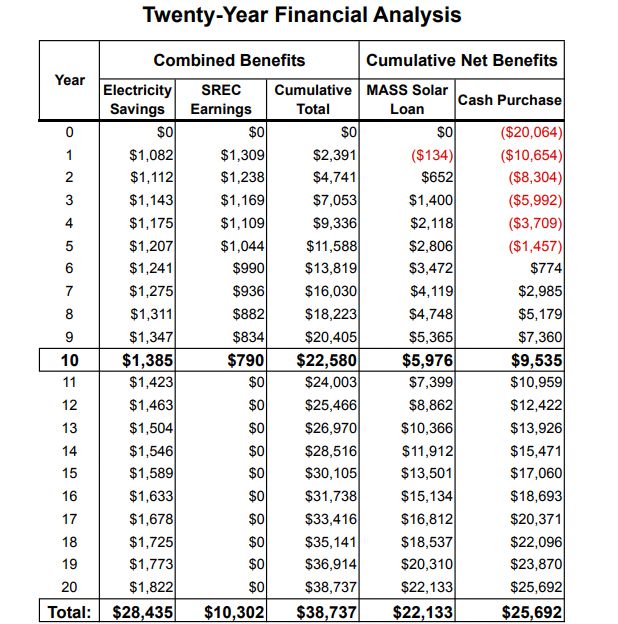 So if a solar array costs $15,000 to install, you’ll receive $4,500 back from Uncle Sam and another $1,000 back from Massachusetts, bringing the net cost down to $9,500. Plus, there are Solar Renewable Energy Certificates (SRECs). It’s a bit complicated, but here’s how this program works: Massachusetts requires its utility companies to get a certain percentage of their electricity from renewable sources. Because they can’t necessarily hit those goals yet, they can buy renewable energy credits from private homeowners who produce clean energy. That means that, currently — the SREC program is being gradually phased out, though something similar but less lucrative is expected to replace it — you can sell an SREC for a couple hundred bucks each time your system produces 1.25 megawatts of electricity (four times a year for an average household). PLUS, Massachusetts offers Solar Loans. The state also guarantees the Solar Loan program, which allows homeowners to take out a low-interest loan to install solar panels. Unlike a home equity loan, it doesn’t place a lien on your house — the solar panels and your SREC income act as the collateral. It’s also open to people with less-than-perfect credit, and you can re-amortize the loan for free once you get your 30% tax refund (basically you pay that amount toward your loan to lower the rest of the payments). It can increase your home’s value. A few studies have shown that solar panels generally improve the value of a home, though this isn’t true for leased panels, which can create minor headaches when you go to sell. But if you own the system outright and it’s in good condition, of course a potential home buyer will see the benefit of not paying for electricity for the next decade or more. We get a surprising amount of sun — and crisp, cold days. It may surprise you, but going solar makes just as much sense in Massachusetts — home of monster Nor’easters — as the sun-soaked desert hellscape they call Arizona. (Did I say that out loud? Sorry, I don’t like the heat.) That’s because solar panels, like a lot of electronics, operate more efficiently in cool weather. I’ve noticed this on our own rooftop array — we hit peak production several times in April and May, but rarely got anywhere near it on the hot sunny days of July and August. Anyway, there are a lot of reasons solar makes sense. All told, homeowners who install solar panels can save tens of thousands of dollars over 20 years. In my Globe article, I wrote, “Imagine spending $15,000 to remodel your bathroom and getting a fancy new eco-friendly faucet that spits out money for the next 20 years.” That might seem a bit much, but it really is a fair comparison: Installing rooftop solar can boost your home’s value as much as a kitchen remodel, and it turns your house into a green power plant that literally pays you money. Not even a fancy SubZero fridge offers that feature. Getting those savings requires an upfront investment, of course. The average 5 kilowatt rooftop solar system costs about $15,000 to $20,000 installed, according to EnergySage. But that’s before the many tax credits and other incentives are factored in. As noted above, a $15,000 installation may only cost you $9,500 after tax incentives – and you’ll earn SREC income on top of that. Meanwhile, you can usually fiddle with the numbers until your loan payment is roughly equal to what you were paying for electricity. So in practical budgeting terms, you won’t see much of a cost difference at first, and then eventually you’ll get years of free electricity. Buy your solar panels if you can (don’t lease them). You can go solar with little or no upfront cost by leasing your panels — this is where a company like SolarCity installs the panels on your roof, and sells you the solar power they produce (generally at a lower rate than your utility company charges). They take care of the installation and any future repairs or maintenance (though there usually isn’t any of that to worry about). When the lease is up, after 20 years or so, you can either renew it or they’ll come and take the panels off free of charge. Leasing is a cheap and easy way to go green and save money on your electric bill at the same time, which makes it pretty appealing. However, when you lease, the company keeps all the tax benefits — this is why it works out for everybody – and it makes selling your home a little more complicated (you either have to buy yourself out of the lease or sign it over to the buyer). You’ll save a lot more money over the long run if you can purchase your panels outright. 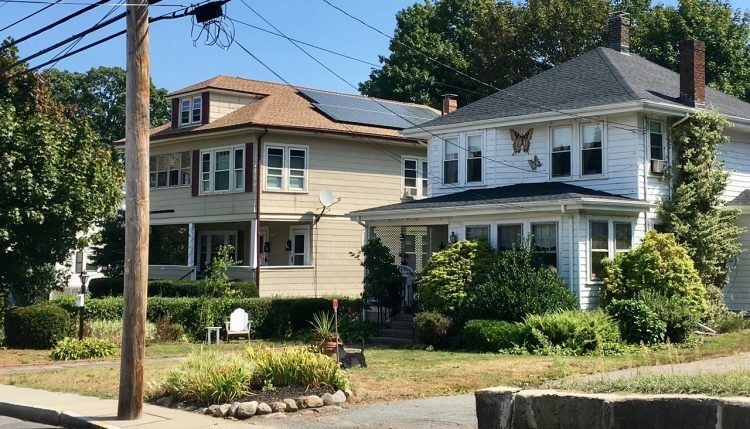 It’s now easier to do just that, even for lower-income homeowners or those without great credit, thanks to the Massachusetts Solar Loan program. This is a low-interest, fixed-rate loan offered by local lenders (and backed by the Commonwealth) that allows you to pay for the panels upfront and spread out the cost over 10 years. In the first year, your payments are a bit higher, because they float you the amount you’ll receive in tax kickbacks the following year. But once you get your 30% tax rebate, you can pay that money toward the loan and they re-amortize it (create a new payback timetable) to lower your payments for the last 9 years. Our combined electric bill for both units was about $110/month. We installed 15 solar panels and it cost about $20,500 before any tax credits – that’s the amount we took out through a solar loan. Our payment right now is about $195/month — so, higher than our electric bill, but not crazy higher. 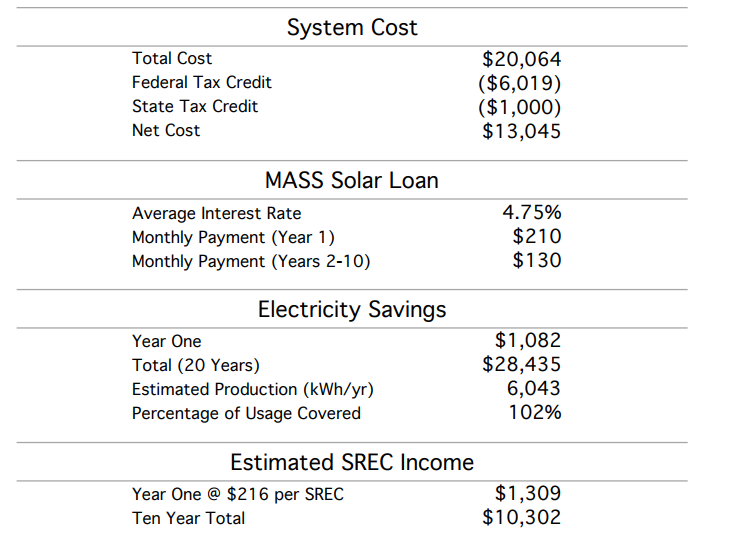 Once we get our tax kickbacks in March (about $6,000 federal, plus another $1,000 from Massachusetts), we’ll put that toward the solar loan and our payment will go down to about $120/month for the following nine years. Still higher – but because electricity rates tend to rise a few percent each year, in a few years that $120/month will probably be lower than our bill would have been otherwise. More importantly, because the panels are guaranteed for 20 years (and often last longer than that), we’ll be raking in completely free electricity for a solid 10 years or more once the loan is paid off. Even at today’s electric rates (which will only go up), that’s worth about $1,400 a year. And to sweeten the pot, remember the SRECs I mentioned above? We’ll earn about $200-$250 for each 1.25 MW of electricity we produce (about $1,000 to $1,250 per year) for the first few years. While that will eventually phase out (we’ll keep earning SREC income through Year 10, but it slowly drops), it helps offset (or actually completely offsets) the higher first-year payment. However, SRECs are paid out on a delayed, quarterly basis — so we’re only getting our first payment in October for energy we produced in the spring and summer. In that regard, it does create a very minor cash pinch for the first few months – but one that’s entirely worth it. Have I convinced you yet? (It’s not hard – I feel like solar panel salespeople have the easiest job in the world right now.) Here’s what to do if you’re interested in getting rooftop solar panels. Step 1: Check your sun. This is important, because solar will only make sense if your roof is right for it. Generally, you want a large portion of your roof facing south, southwest, or southeast, without a lot of trees in the way. Enter your address into Google’s Project Sunroof tool, and it will calculate how much sunshine your roof gets and how much space is available for panels. Our roof is big, basic, and faces south, with plenty of sun from about 11am ’til sunset, so we were good candidates. Step 2: Fix your roof, if needed. The good news is, if you need to replace your older roof to install solar panels, you can actually finance that expense (budget about $10,000) through your low-interest solar loan. That’s a pretty sweet perk! Of course, if you need both a new roof and solar at the same time, you could consider getting Tesla’s new solar roof — an entire roof comprised of solar panel shingles. This is, undoubtedly, one of the coolest innovations in the industry, and you’re in good hands with Elon Musk and Tesla (who now owns SolarCity). It’s also guaranteed for 30 years (most solar panels are guaranteed for 20 years). But while Tesla’s solar roof is cheaper than most of us expected it to be, it’s still pretty pricey upfront, in the $40,000 to $60,000 range for the average house. Step 3: Time it right, if possible. Ideally, you want to get your system installed in time for spring. The long days of April, May, and June will help you bank lots of net metering credits for winter. That means you want to get the process started over the winter if possible, because it might take a month or two before your preferred installer can fit you in. Pay attention to the tax credit schedule, too. You can expect some backlogs as they begin to phase out after 2019 and people rush to get panels installed before that year’s end. Step 4: Get quotes from a few installers. We used EnergySage.com to get estimates from a handful of different installers, and found the process very simple and easy to understand. You can just upload a PDF of your current electric bill (or enter the data on it, like your annual electric usage), and several solar installers will get back to you with full quotes, good for 30 days in most cases, with estimates about what size system you need, what type of panels they recommend, how much money you’ll save, and the cost of installation. We ended up using Great Sky Solar, an employee-owned outfit comprised of some very thoughtful, friendly, and knowledgeable folks who used to work at bigger solar companies like SolarCity and were kind of jaded by their experiences there. They were great to work with and, while it took a few weeks to fit us in to their busy work schedule, they completed the entire installation in one day and helped us navigate the solar loan paperwork and utility hookup. Great Sky was also really careful about aesthetics, going out of their way to make sure the panels were centered on the roof and that the wiring was hidden as much as possible. Once you’ve got a quote you like, go to MassSolarLoan.com and find a lender in your area. Applying for a solar loan was easier than applying for, say, a mortgage or home equity line, but it’s still pretty involved. You don’t have to take out a solar loan — of course, paying with cash is the best option since you won’t pay any interest — but it does have some key benefits. For one, the interest rate is capped at a below-market rate. And unlike a home equity loan, the solar loan doesn’t put a lien against your house; if you should default, you won’t face foreclosure or anything, they’ll just take your SREC income and your solar panels. Once you’re approved, the lender and the solar installer will take care of most of the details for you, and walk you through the sometimes confusing trail of paperwork. The project needs to get approved by various state parties and the utility company, for example, and you’ll receive two checks from the lender: One for a deposit, and one for the completed project. Step 6: Flip the switch (once you get the OK). 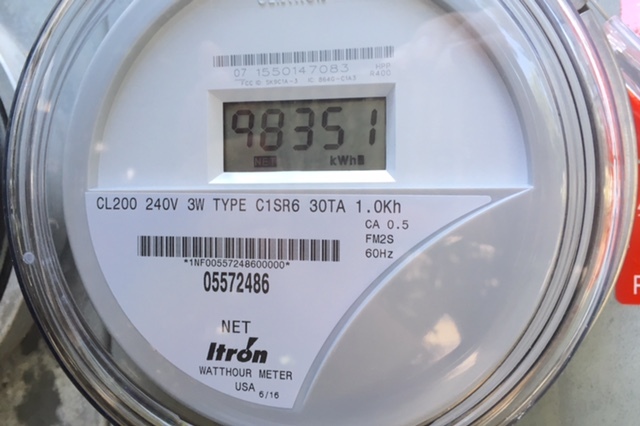 After your solar panel installation is complete, it can take a week or more for the utility company to approve the job and come install a two-way electric meter (which measures how much power you’re using and how much you’re feeding back into the grid). If you try to turn on your system before then — and you can, it’s technically operational — you’ll end up paying dearly, because a traditional meter registers any current that passes through it. So when your panels are producing excess power and feeding it into the grid, a traditional meter would charge you for it rather than crediting your account. So make sure you wait until the utility company installs a two-way meter and gives you the all clear. At that point, you can just flip the “off” switch to on, and start turning sunshine into electricity – and money. Step 7: Monitor your production and wait for the SRECs to roll in. Your installer will also help you set up an account with SRECTrade.com, a consumer website that allows you to cash in your SRECs. The website essentially acts as a broker and takes a small cut for their trouble. As you can see, we’ve produced 3.17 megawatt hours (MWh) of electricity since our system was installed in April, so in the next round of quarterly SRECs we’ll be eligible to sell two certificates. 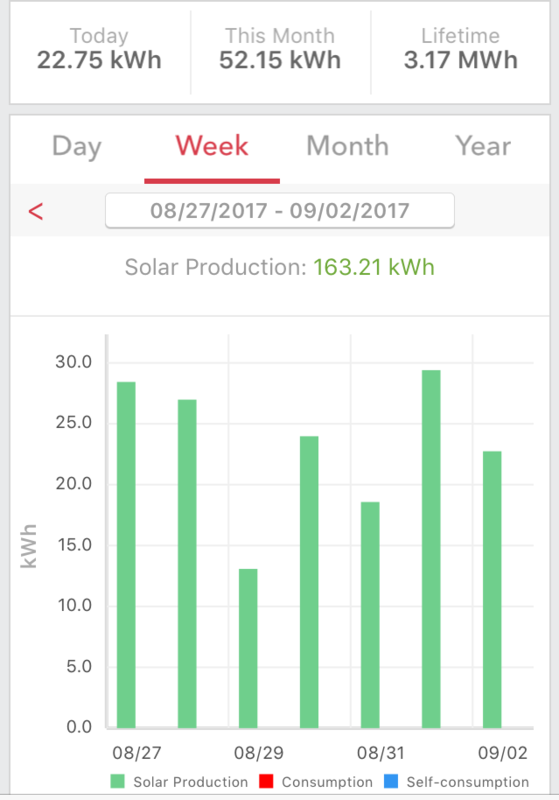 Between both units, we use about 12 kWh of electricity a day, which means we’ve already banked a 137-day supply of electricity. And of course, your array still produces power on sunny winter days – just not as much. It depends a lot on where you live, the condition and position of your roof, and whether you plan to stay in your home long enough to break even and reap the rewards of your free electricity. A comparison site like EnergySage can help you with the math and other influencing factors. It also depends on whether you like the look of them. 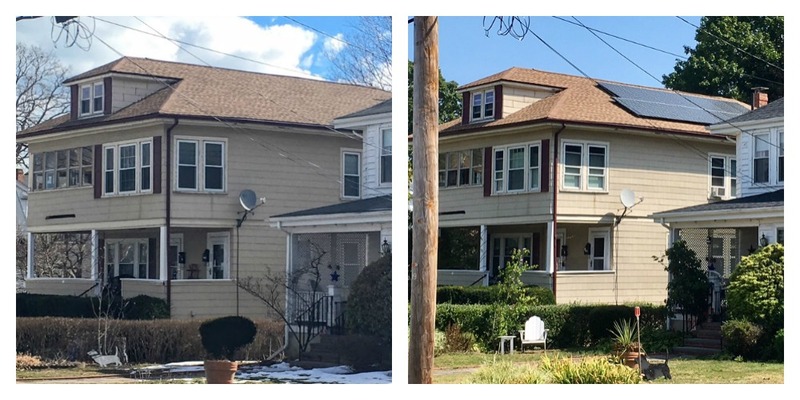 Personally, I think they look great on our hulking two-family — but if you’ve got a beautiful old Victorian, you’d probably want them on the back of the house, if at all. Here’s a before and after shot of our roof — if anything, it looks better (maybe one day we can get stupid DirecTV to take their satellite dish back). But if you’re looking for a way to help the environment and save (or even make) money doing so, installing rooftop solar is one of the most slam-dunk ways to do so — and now is the time to look into it, since the tax credits will begin to phase out after 2019. 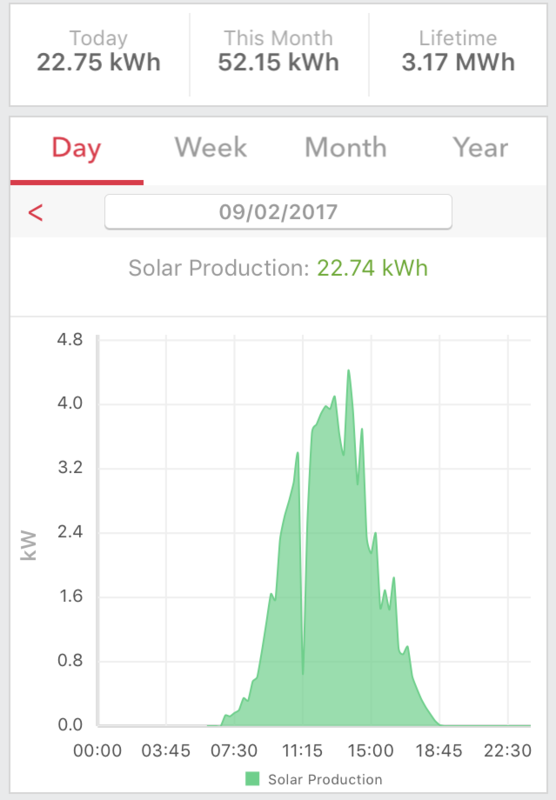 In our case, installing solar panels was 100% worth it, and I couldn’t be happier.